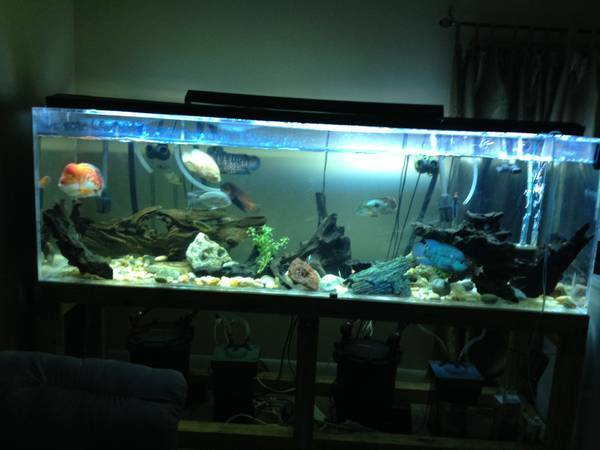 I have a used 300 gallon acrylic drilled aquarium. It is 96 x 24 x 30 valued at $1900 new. Acrylic is MORE expensive than glass but weigh less. The stand (very heavy) was made to hold a 800 gallon aquarium constructed with 4X4s, metal braces, screws, glue and nails at a cost of $400. Must bring help and a large truck, I will not be able to help you move it!!! So all together you are getting: (1) an acrylic 300 gallon (2) a stand that will last a lifetime. All this for $1400, Don’t miss this opportunity, you will definitely regret it!!!! !